Absolutely fantastic! The best Space Opera I’ve read. 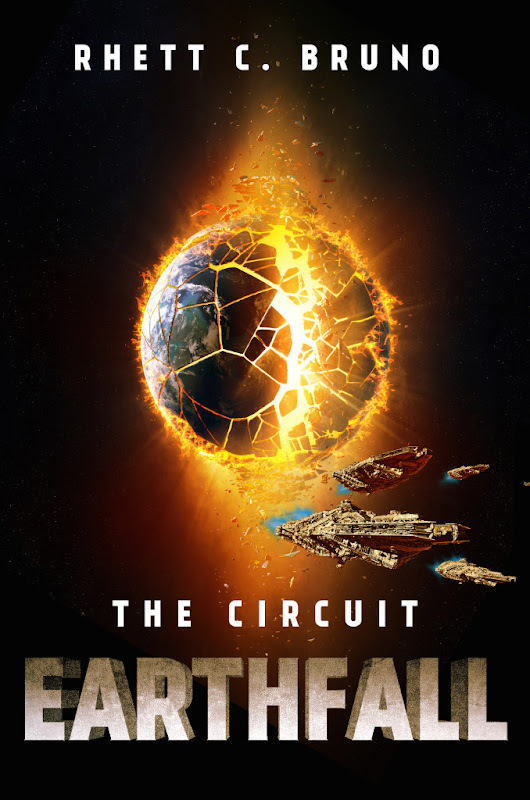 THE CIRCUIT: EARTHFALL is the last part of the author Rhett C. Bruno’s the Circuit trilogy, and it was an intense and suspense read. But I still think that this should have been one long novel instead of cut in three parts with “To be continued”-like endings. You definitely need to read all three parts, THE CIRCUIT: EXECUTOR RISING, THE CIRCUIT: PROGENY OF VALE, and the last part: THE CIRCUIT: EARTHFALL. And in that order. Otherwise you will not understand much or get much out of this brilliant story. To me, the most interesting character in this story was ADIM the Android. It was amazing and interesting to follow how ADIM developed through the story. Earth is uninhabitable, but beneath its ruined surface sits massive deposits of Gravitum, a powerful, dangerous element with the ability to generate artificial gravity. Whoever controls the element can control the settled regions of our solar system, now known as the Circuit. For centuries the peoples of the Circuit endured an uneasy if peaceful alliance designed to share resources. Now the Tribunal, a religious order, is nearly ready to take over all of it. With only the reconvened band of Clans inhabiting the asteroid belt known as the Ceresian Pact standing between the Tribunal and system dominance, one man––Cassius Vale––intends to end their oppressive rule. Vale’s brutal and brilliant plan is nearly complete. In order to gain more time to complete preparations, Vale builds an army under the control of his robotic creation ADIM in order to attack one of the leaders of the Tribune. ADIM loves his creator but is growing more independent by the day, and soon may be too powerful for anyone to stop. Talon Rayne, a mercenary, teams up with Sage Volus, a former Tribunal spy when Talon discovers that his daughter has been captured by the very Tribunal leader Cassius Vale is after. Together, they have no choice but to ask for Vale’s help in saving her. Vale agrees, but are they just another cog in his scheme for bringing down the Tribune, or is there a part of him left that cares about anything other than vengeance? I give this Science Fiction book 5/5 in score.